From that first bite of blueberry pie, oozing with the sweetness of Northern Indiana’s favorite home-grown fruit, through the fireworks extravaganza that brings oohs and ahhs from a crowd of thousands, visitors are hooked on the incredible array of all-American fun at the Marshall County Blueberry Festival. The community of Plymouth welcomes guests from across the country to one of the most celebrated of Midwest celebrations Aug. 31-Sept. 3. 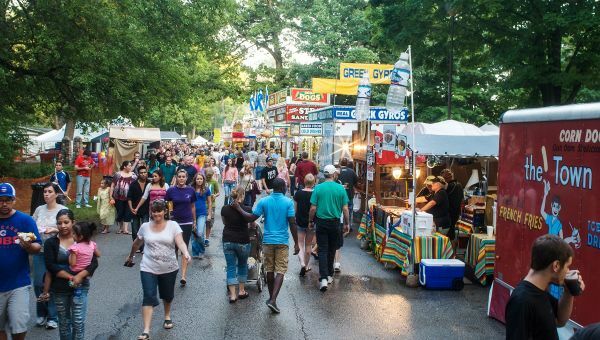 The festivities fill the Labor Day weekend with four days of nonstop fun in Centennial Park. Naturally, the festival’s namesake blueberry stars in delicious concoctions – pies, ice cream shakes, sundaes, cheesecake. And don’t forget the donuts! During each festival, the ever-popular Blueberry Donut Stand turns out thousands of their delicious creations, filled with blueberries grown right in Marshall County. The berry lends its name to a host of other activities, like the big Blueberry Parade on Labor Day, featuring high school bands, fire trucks, police units, classic cars, antique tractors, National Guard members, and fanciful floats from local civic groups. Start the day with the wildly popular Blueberry Stomp, consisting of 15k, 5k, and fun runs, or cruise on the Blueberry Bike Ride. The Blueberry Buddies Area provides games and storytelling for the little ones. There’s so much going on at the Blueberry Festival, you could fill more than four days if you covered everything. Some 300 artists and crafters from across the U.S sell their creations to the arts and craft fair, where you’ll find everything from paintings and pots to jewelry and soaps. A host of sporting events include local softball and volleyball tourneys, plus shuffleboard, horseshoes, and arm wrestling. Roam the Hoosier Old Wheels Antique Car Show and delight in the Hot Air Balloon Launches and Glow. Three stages bring rollicking entertainment to the festival. You’ll hear talented musicians performing rock, country, Christian, and gospel. Local school choirs and dance groups take the stage as well. And, of course, carnival rides feature safe fun for the kids, thrills for the older crowd, and plenty of games and fair food. Even though the Marshall County Blueberry Festival has been going on for half a century, it stays true to its roots and its objective – to provide quality family activities at little or no cost, and a venue for not-for-profit groups to raise funds. In fact, most of the local organizations that participate are able to raise enough money at the festival to operate their charitable endeavors for the year. And festival-goers couldn’t be happier when the Elks serve their biscuit and gravy breakfasts or the Optimists their pancakes or the Women of the Moose their sought-after blueberry pies. They’re just another great part of a fun-packed four-day celebration that benefits everyone.